When it comes to protecting your motorcycle from thieves, you can never be too careful. You’ve probably invested in alarms, tracking devices, and other tools to keep your bike from getting lifted, but it can be much harder to lock down the gear you bring with you on the road. Helmet Lock: No rider wants to lug around their helmet, and helmet locks offer a simple and inexpensive solution to this problem. Carabiner style locks generally require a programmable code, and cable locks and lock straps can usually be extended to secure other gear. These devices can be easily stored while you ride and give you peace of mind while you’re out exploring your destinations. License Plate Storage Box: Discreet storage boxes like the DrySpec Stash Box are mounted between your motorcycle and its license plate. These weather-resistant, lockable devices are the perfect size for storing motorcycle registration and insurance documents and other small items you may need on the road. Anti-Theft Bag Protector: Even when your bag is locked down to your motorcycle, a determined thief could probably find a way to snag your valuables. Pacsafe’s stainless steel eXomesh® system is slash proof and can be secured to your motorcycle or another fixed object. The brand’s anti-theft backpacks offer additional protection at times when your bag isn’t enclosed by the system. Not sure if your motorcycle security is up to par? Follow these three tips to avoid becoming a victim of theft. 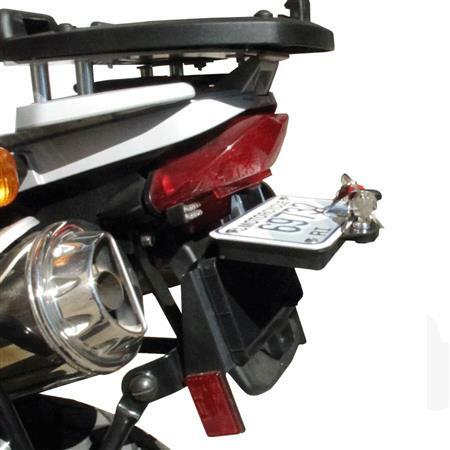 Which motorcycle security accessories do you keep with you on the road? Tell us about your favorites in the comments.